Many of you will be aware of the recent test flight of the Virgin Space Ship Unity. On 13 December 2018 it reached an altitude of 82.7 km and was widely reported in the media, for example the BBC news website, as reaching ‘the edge of space’. Although no definite dates have been set, VSS Unity is the spacecraft on which Richard Branson’s Virgin Galactic group hopes to take fee paying passengers into space later this year. Although this is a great achievement for Virgin Galactic, the Virgin Galactic ‘astronauts’ did not get quite high enough to reach space at least according to the most widely used definition of where space begins. The altitude of where the Earth’s atmosphere ends and space begins is somewhat unclear. The Earth’s atmosphere consists of gas and there is obviously no fixed boundary where it ends, and space begins. As we get higher in altitude its density falls until it eventually reaches the very low density of five particles per cubic centimetre found in interplanetary space. In the diagram below, I’ve illustrated some different altitudes and I’ll discuss whether each of them could be considered to be in space. 8.8 km – The summit of Mount Everest. At this altitude the air pressure is only one third of that at sea level. A young fit person acclimatised to high altitude could not survive for more than 30 minutes without needing extra oxygen. 10.6 km – Boeing 747 cruising altitude. The air pressure at this altitude is around 24% of that at sea level and a human would be dead within minutes from lack of oxygen. Even so, this altitude is not generally considered to high enough to be defined as in space. 20.7 km – Concorde maximum altitude. This was the maximum altitude which the supersonic aeroplane Concorde achieved and it occurred during a test flight in 1973. At this altitude air is so thin that the sky is dark blue in daytime and the air pressure is only 7.6% that of sea level. Concorde was in service between 1976 and 2003 and could travel at a speed of 2,180 km/h – more than twice the speed of sound. It had a maximum cruising altitude of 18.3 km and was advertised as travelling ‘on the edge of space’. At 20.7 km the boiling point of water is only 30 degrees Celsius, so a human being whose body temperature is normally 37 degrees would be subject to an extremely unpleasant fate unless they were enclosed in a space suit or a pressurized cabin – the water in their eyes, mouth, throat and the lining of the lungs would literally boil away. 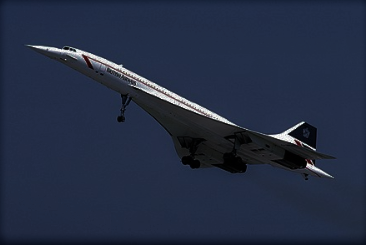 Therefore, it could be argued that Concorde on this test flight was travelling in space. 100 km – an altitude known as the Karman line which is usually taken as the boundary of space. I will discuss this later. 150 km – approximate minimum altitude for a satellite to complete an orbit. 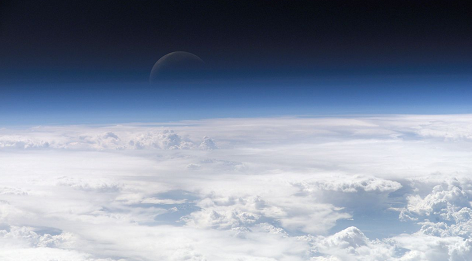 At this altitude the Earth’s atmosphere has about one billionth of its density at sea level. When a satellite is in a low orbit around the Earth, its rapid movement through the very tenuous traces of the Earth’s atmosphere results in friction, which causes the satellite to lose energy and spiral back to Earth. The higher a satellite’s orbit, the thinner the atmosphere, which means that there is less friction and it remains in orbit longer. At 150 km, the thickness of the atmosphere is such that a typical satellite would theoretically be able to complete a single orbit but it would be spiralling down towards the Earth quite rapidly. At altitudes below 150 km, a typical satellite would not be able to complete a single orbit. In fact this minimal orbital altitude is only approximate, as the amount of friction slowing down a satellite also depends on the size and shape of the object. At an altitude of 150 km, a heavy streamlined satellite could stay up for longer than one orbit. 400 km – International Space Station (ISS). At this altitude the atmospheric density is a miniscule half a trillionth (0.000 000 000 000 5) of its density at sea level, but this very tenuous gas still causes a small amount of atmospheric drag on the ISS. 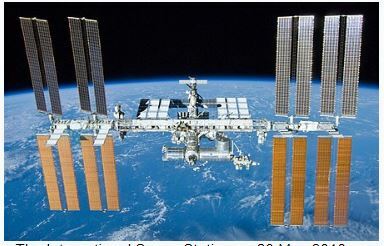 The ISS loses altitude at the rate of around 2 km per month and needs to fire its own rocket motors (or those on visiting spacecraft) a few times a year to raise its altitude. If it didn’t do this, the ISS would continue to lose altitude and would return to Earth in a few years, breaking up in the process. 1000 km – at this altitude the atmospheric density is so low that a satellite will remain in orbit for over 1000 years without returning to Earth. Altitudes above 100 km are significantly affected by solar activity. The figures in the table above have been taken for low solar activity. The Fédération Aéronautique Internationale (FAI), the international body setting standards and keeping records in the field of aeronautics and astronautics, defines space as starting 100 km above the surface of the Earth. At this altitude the atmospheric density and pressure are more than a million times lower than they are at sea level. This altitude is called the Karman Line after the Theodore von Kármán (1881-1963), a Hungarian-American mathematician, aerospace engineer, and physicist. He calculated that at approximately this altitude it would not be possible for an aeroplane to fly because the air density is too low for enough lift to be generated by airflow over the aircraft wings (see the notes below for more details). The historic achievement has been recognised by the Federal Aviation Administration (FAA) who announced today that early next year they will present pilots Mark “Forger” Stucky and Frederick “CJ” Sturckow with FAA Commercial Astronaut Wings at a ceremony in Washington DC. However, when it starts commercial operations Virgin Galactic will take space tourists to a maximum altitude of 110 km, 10 km above the Karman Line. This will avoid any argument about whether they have travelled high enough to reach space. As described in a previous post the flight will have a price tag of $250,000, which is a little too expensive for me. I would like to thank you for reading and following my blog – some of you for the last five years – and wish you a happy and successful 2019. To find out more about the Science Geek’s blog, click here or on the Science Geek Home link at the top of this page. The motion of an aircraft through the air is governed by four forces. Thrust is the forward force provided by the engines which pushes the aircraft forward. Drag is the force caused by air resistance as the aircraft moves through the air. It slows the aircraft down. Weight is the downward force due to gravity. 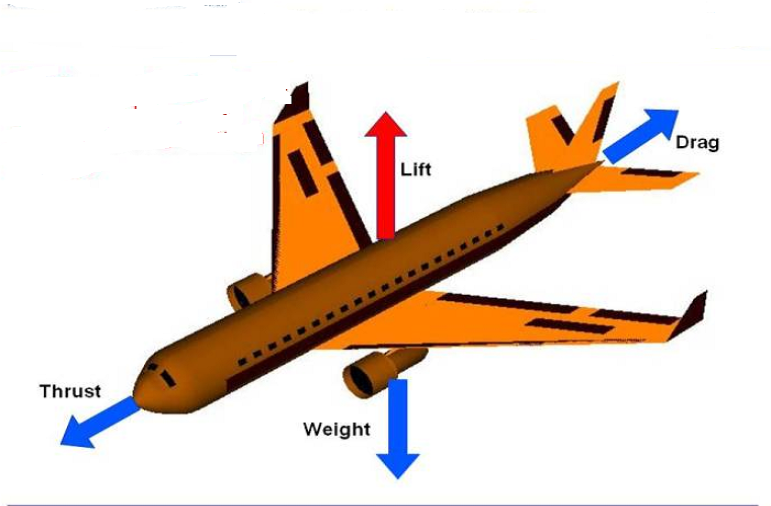 Lift is the upward force caused by the fact that when an aircraft moves through the air, the air pressure is higher on the underside of the aircraft’s wing compared to the topside. This higher air pressure on the underside pushes (or lifts) the aircraft upwards. Where the terms are as follows. CL is a number known as the lift coefficient, which depends on the size and shape of the wings and properties of the surrounding atmosphere. For an aircraft to remain at a constant altitude the amount of lift generated must be equal to the weight of the aircraft. From the lift equation, as the density of the atmosphere falls, an aircraft must move faster to generate the same amount of lift. 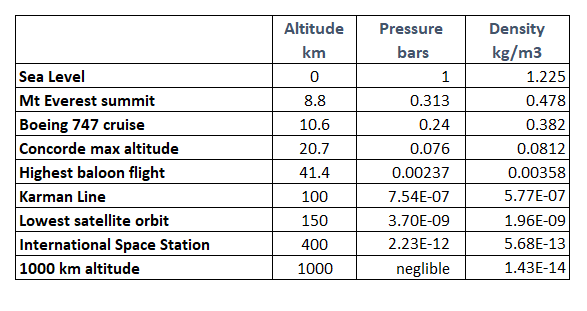 At an altitude of around 100 km the atmospheric density is so low that an aircraft’s velocity needs to be greater than 28,200 km/h to provide enough lift. 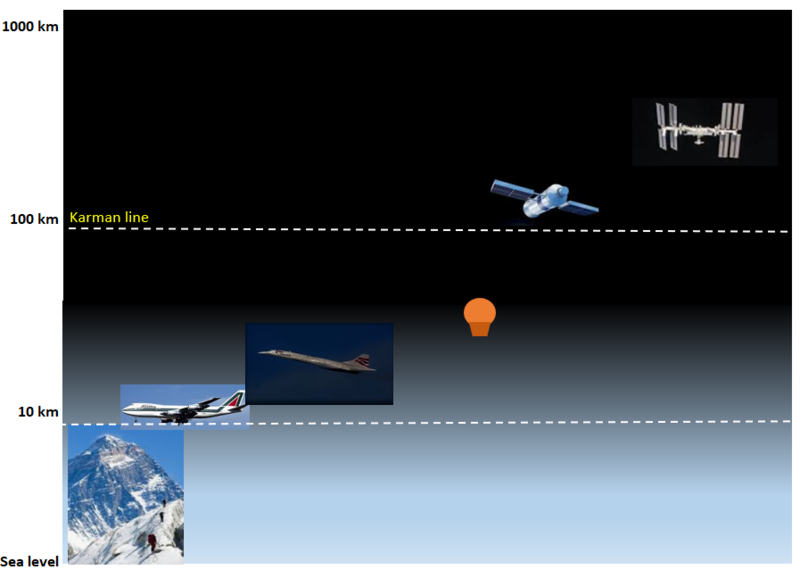 This is the velocity needed to get into orbit, so an aircraft moving at altitude of 100 km would actually be in orbit around the Earth and its passengers and crew would be weightless. Thanks Geek, and a very happy New Year to you and yours. Long may you continue delighting your many readers. I thought you would appreciate seeing this about the ISS altitude. A fascinating post and one to which I’ll keep referring. Thanks for putting it out here and have a happy, healthy and prosperous 2019. Thank you very much and hope you have a great 2019 ! Thanks for this information, it will be interesting to see how Richard Branson’s space adventure develops commercially. Happy New Year! 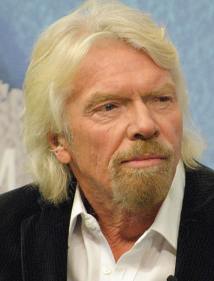 Richard Branson stated that Virgin Galactic would be taking fee passengers into space by early 2010 ! So obviously things have slipped a little. Thanks for the understandable information. I don’t think I’ll ever get to outer space but I also don’t really want to. I have enjoyed many of your articles over the last few years. You make an interesting point about Milton Keynes! I wonder what its residents thinks? Are they living in space? Maybe I should write a post about it? Interesting question! Thanks for an interesting post. I was thinking about space today after reading about the New Horizons spacecraft going past a Kuiper belt object, 2014 MU69. I struggled to visualise just how very far out that is – 49AU!!! Interesting and clearly presented as always, Mr Geek. Mr Branson’s hair (though longer) resembles Mr Trump’s too closely for my liking and that’s really worrying. [Sorry – couldn’t resist]. Thank you very much for your support and interesting comments on my posts over the years. I hadn’t thought about the similarities between Mr Tumps and Richard Branson’s haircuts, but I see what you mean now!!! Even in (outer) space you may encounter particles , meteorites etc. Considering that space is not entirely empty and that you need a certain speed to escape from a certain mass, I prefer to define space as all space outside all the Schwarzschildrdii. For Earth this means further away from the center of the Earth than 9 mm.